Welcome to The Abso!ute Sound online! We explore music and the reproduction of music in the home. We believe that the sound of music, unamplified, occurring in a real space is a philosophic absolute against which we may judge the performance of devices designed to reproduce music. Our goal is to provide the resources consumers need to judge how a component's sound either honors or departs from the music's truth, and to make sound purchasing decisions that maximize their experience of reproduced sound. Below is our Issue 244, July/August 2014 table of contents and editorial. 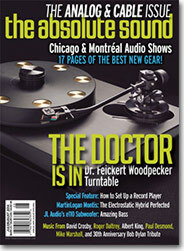 16 Industry News : Overture Ultimate Home Electronics hosts Robert Harley for a book signing and Magico founder Alon Wolf for an S3 demo; Spencer Holbert reports from the Montréal show; Neil Young launches the Pono high-res music system; Fine Sounds debuts a successor to Sonus faber's legendary Extrema. Discover the best new gear at the Chicago audio extravaganza. Jonathan Valin and Andre Jennings show you how to perfect your vinyl setup in this step-by-step guide. Spencer Holbert auditions an affordable 'table from a British company with a long and storied history in analog. We've been wowed by this German manufacturer's upper-end 'tables; its entry-level offering proves to be a winner as well. Spencer Holbert reports. Neil Gader covers two new cartridges priced at $299 and $999. Analog guru Andre Jennings weighs in on this mid-priced turntable with a host of options and upgrades. This mid-priced interconnect comes with a fair share of pleasant surprises, says Neil Gader. A relative newcomer to the cable scene, Moon Audio has created a flat-out bargain with its new Silver Dragon II interconnect. Neil Gader reports. Neil Gader on Wireworld's top-of-the-line cable and interconnect. Despite being about two-fifths the price of the original Galileo system, Synergistic's new Galileo LE is still a challenger for the state of the art in cabling, says Jonathan Valin. Discover why this electrostatic/dynamic hybrid from MartinLogan has Paul Seydor running out of superlatives. Thought the CD transport was dead? Simaudio has reinvented the category with new features and options that bring it into the computer-audio age. Neil Gader reports. Jonathan Valin has his anti-subwoofer worldview turned upside down by the affordable new e110s from JL Audio. Jeff Wilson discovers some new Old World sources for jazz on vinyl (and CD too). Duck Baker on another new source for vinyl (and CD) jazz reissues. Wagnerian singer Stephanie Blythe records Kate Smith at Berkeley California's Meyer Sound. Andrew Quint is impressed. 142 Rock : New releases from David Crosby, Roger Daltrey, Jack Bruce, Chuck E. Weiss, Tony Trischka, and The Infamous Stringdusters; reissues of the Bob Dylan 30th Anniversary Celebration Concert on CD, and of Albert King and Lula Reed on Sundazed vinyl. 148 Classical : Wind Ensembles on 2L, orchestral showpieces on Reference and Mariinsky, choral music on Aurora, and violin duos on Sono Luminus. 152 Jazz: The latest from Nels Cline, Chris Speed, Brian Blade, Mike Marshall, and the Pixels, along with Paul Desmond and Gerry Mulligan back on LP. 160 We chat with Bob Surgeoner of Neat Acoustics.